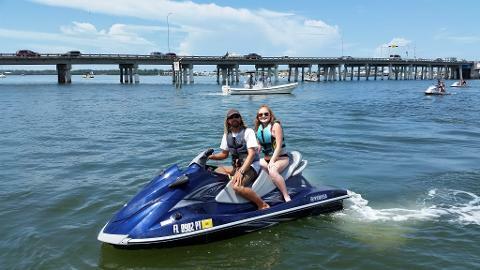 H2O Watersportz offers the largest unguided riding area of any rental in the area! 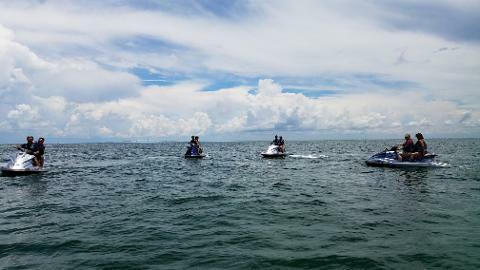 We offer 3 rider jet ski rentals starting at 1 hour extending to a full day. 1 hour is your basic quick fix to fun. It goes by very fast but does the trick. 1.5 is that sweet spot between the 1 and 2 hour rentals. The 2 hour rental will get you all the way around the island *weather permitting. You will receive excellent instructions on where to go & how to get there. We supply anchors for you to utilize on sandbars for shelling or snorkeling. Our orientation is lengthy but if you feel you will need more information for any reason (first timer, lengthy rental, large group, testing or even if English is not your first language) please arrive early! We are happy to spend the time with you but we will not alter a rental time or shorten your instructions due to insufficient orientation time allowances. Even though these offer a 3 rider option it is recommended that 2 adult sized individuals max go on one ski. An adult and 2 small children would be comfortable. 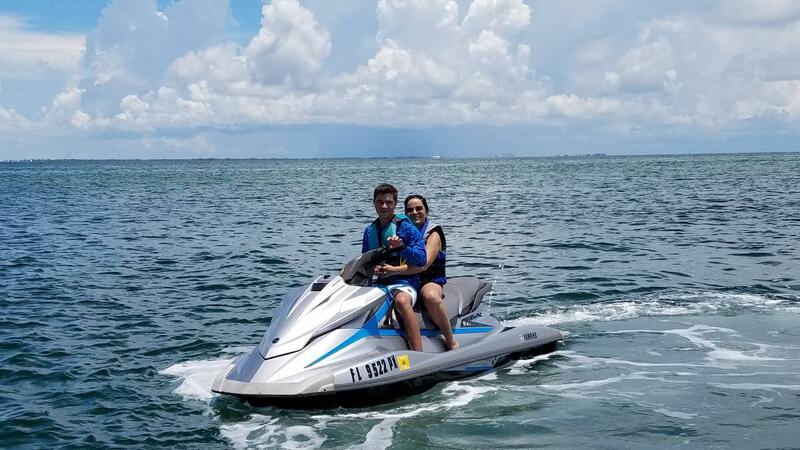 There are rules and regulations associated with renting or operating a jet ski in Florida waters so make sure you are compliant prior to booking. Must be 18 years old and up to rent with a major credit card and photo ID. Anyone under the age of 18 must have a parent or legal guardian to sign for them to participate in this activity. Photo ID (passport of drivers license required) School ID's are not valid forms of identification. Valid ID's must have a photo no more than 5 years old and birthdate on same document. Those born 1/1/1988 must have a boating license on their person at time of rental. If they do not have a boating license with them they must take a boating certification at the time of their rental. $3.00 fee is charged per test. You must arrive 60 minutes prior to your rental if this is a requirement due to your date of birth. Anyone operating born in 1987 or before must arrive 30 minutes prior to reserved time. An orientation is mandatory for all operators in Florida waters. 14 years of age and up may drive with the above mentioned documentation. http://myfwc.com/boating/safety-education/courses/ for local boating regulations and courses please follow link provided.